Even the redoubtable wisdom of Rush Limbaugh has trouble categorizing the false Left. Fake news, fake morals, and fake righteousness; claiming moral authority does not make you right when you embrace immorality by declaring it normal. The Left seeks to immunize itself against moral judgement by declaring their self-righteous hypocrisy as godly. You can’t spell “leftist” without the L-I-E-S of Fakirs, Tramps, and Traitors. The ideology of the Left is fake morality, fake righteousness, and fake information all based on false premises that their dysfunctional thinking and warped morality is righteous. They take a stand against racism by being against white supremacists, but in doing so they stand for anti-white racism. Lacking a true moral compass they don’t understand the self-righteous hypocrisy they practice. They believe their way of standing up against anti-black racism by standing for anti-white racism does not make them racists. The left’s distorted corruption of truth and morality is difficult for even Rush Limbaugh to explain. Trying to sum up their false ideology of deception and hypocrisy in one sentence is difficult when you approach it from their point of view – that they are without sin. The Left is dysfunctional morals derived from false facts leading to a fraudulent belief in their own self-righteousness. They are like the people who go to church, learn something about righteous morals, and then proceed to condemn everyone else for being sinners while they wallow in their own sins turning a blind eye to their own defects. They are the embodiment of the self-righteous hypocrite! Learning that the sin of racism exists they condemn all others as racists, but cannot see themselves objectively. Their lack of a moral compass blinds them to their duplicity. While righteous Christian men are abhorred by the KKK and neo-Nazis rejecting them, the Left tries to paint them as supporters only because those vile groups attempt to align themselves with Republicans. The neo-Nazis and the KKK have no home in the Republican Party. They were born and bred in the Democrat Party and have merely chosen a side that stands against Democrats. Their party has abandoned them and all white working people in favor of minority hate groups and foreigners leaving the former militant arm of their hate group orphans in favor of other orphan haters. The Democrat Party no longer represents Americans except those who would submit themselves to the racist ideology and dysfunctional morality of the anti-American Left. Their dysfunction displays itself at their events where they chant anti-American, anti-police, anti-corporation, and anti-white slogans. The dispossessed haters of the left are looking for a home, but will never be welcome among patriotic Republicans. When the KKK goes to a Republican rally and starts chanting anti-black slogans, conservatives leave. When BLM goes to a Democrat rally and starts chanting anti-white slogans, liberals gather. The fake media tries desperately to hang the chain of racism around Republican’s necks, but the only way they can succeed is if they have their zombies tear down all the Democrat memorials so they can erase their history and rewrite it to make Lincoln a Democrat. But where the Right rejects the racism, bigotry, and fascism of the KKK and neo-Nazis, the Left glorifies the racism of Black Lives Matter and the fascism of Antifa. Where conservatives move away from the KKK and neo-Nazis at Republican rallies engaging in violence against the police, the left flocks to BLM and Antifa rioters in their mutual hatred of police. This is exemplified by their attacks on police, chants denigrating cops, and glorifying those who assassinate them. When the righteous say, “All lives matter,” and point out that rioting against free speech is fascism, they are demonized by the self-righteous Left. Everything liberals believe is based on false premises. Socialism is good rather than a tyrannical, oppressive dictatorship. Bigotry is practiced by their enemies, but not by themselves. Global warming is caused by man rather than natural. Islam is a religion of peace rather than an oppressive death cult. Sexual immorality is normal, not immoral, and therefore not self-destructive. Just because sexual immorality is common does not make it right. Teenager’s shop-lifting is common. Should that be made a right? In order to confront the Left you must first confront their false premise that they are right and the Right is wrong. The Left is never right! Only when you stop them from making the truth you speak wrong before you speak it can you begin to tear down their immorality built from their house of cards. There is no racism in the Republican Party – only that which Democrats attempt to assign to them, while the Democrat Party has become composed entirely of every individual bigoted hate group in the nation. That is why the Democrat Party is now America’s largest hate group. They have become the party of the America hater who want to destroy the Constitution and the Christian church on which this great nation was built vs. the patriots who love freedom, love God, and love each other. 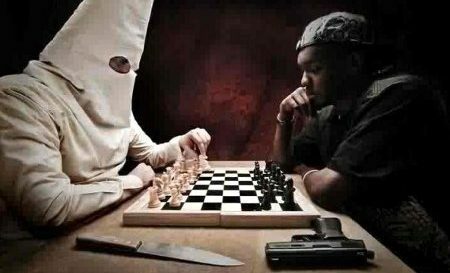 Their ideology of division through hate is illustrated in their pushing out one group of devoted haters – the KKK – and embracing the next group of hater – the BLM. They can only win by portraying the righteous as satanic and dividing the nation against itself. It’s not white supremacy vs. black supremacy, but like all lives matter it is human supremacy – the capacity to treat everyone righteously. Where the Left tries to treat everyone equally, but everyone is not equal. We are all the same, but some choose to walk the dark path looking up at the Sun without seeing the muck where their feet are treading. Christians call this being blinded by the Light that results in fanaticism because the sinner no longer sees the ground on which they tread. That is the essence of how the Left falls into sin and wallows in it.